To be a member of MKHC you have to pay a yearly membership fee. This payment is due by 30th September 2018. To complete application, you will need to complete an online club form where you can submit your payment. Payment must be paid by 30th September 2018 and can be done via our website. Payment via cheque or bank transfer will not be accepted. Goalkeepers do not have to pay any subscriptions fees if they purchase and maintain their own kit. All subscriptions are due for payment by the 30th September 2018, this is due to the club having upfront costs relating to affiliation, umpiring, insurance etc that need to be paid at the start of the season. Any outstanding amounts due after this date will incur a £20 late payment fee and you will be ineligible for selection until the debt is paid. One of the clubs responsibilities as a CASC member is to offer sport for the whole community without discrimination, this includes financial discrimination. If you have any issues with paying the above fees due to unemployment of any other financial hardship then please contact the Treasurer or Chairman directly. 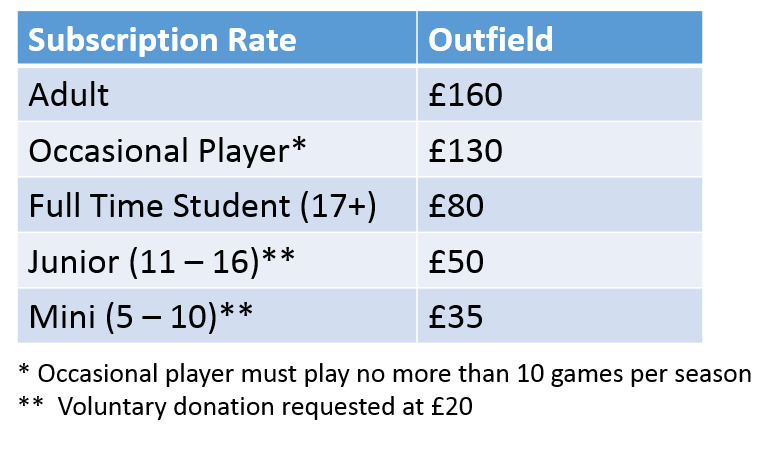 Should you not be able to make the payment in full, please contact the Treasure or Club Captain to arrange and agree instalments.